President George W. Bush hangs a Presidential Medal of Freedom on the neck of Harper Lee, the Pulitzer Prize-winning author of To Kill a Mockingbird, Nov. 5, 2007, at the White House. Pulitzer Prize-winning author Harper Lee has died at the age of 89, according to the New York Times. 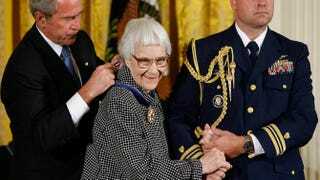 Harper's book To Kill a Mockingbird is not only considered one of the greatest pieces of American literature but, at the time it was published, it was also lauded for its subject matter. To this day, it's part of the curriculum at schools across the United States. Over the last several years, up until her death, Lee had lived in a nursing home not too far from where she grew up in Monroeville, Ala.
Last year, Harper's follow-up to her Mockingbird book was released. Go Set a Watchman became a best-seller even though there was controversy surrounding the fact that no one knew for sure if Lee had wanted it released.